and couples who want enjoy an holiday meeting people, doing sports and taking part in different activities. It is also ideal for families with children thanks to many dedicated facilities and restaurants. 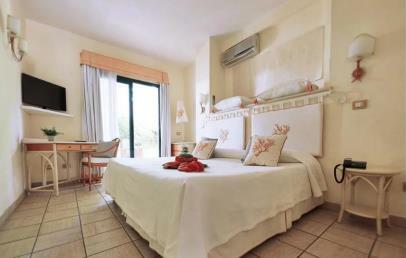 VOI Tanka Resort is located on the south-eastern tip of Sardinia, 1 km from Villasimius and approx. 50 km from the centre of Cagliari. 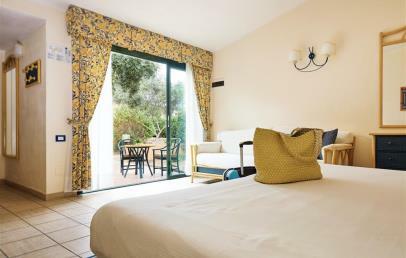 Directly overlooking the beach of Simius, famous for its white sand and its crystal clear sea, the hotel is located within the Marine Protected Area of Capo Carbonara. The VOI Tanka Resort is spread across an area of 43 hectares of mainly flat land that slopes down towards the sea, and lies deep in the Mediterranean brush. Guest rooms and commun areas are linked by a network of avenues and lanes open only to pedestrians and cyclists. All guest services can be found in the resort’s central area located a mere 200 m from the beach. All commun areas provide unrestricted disabled access. The resort overlooks a stunning bay, bordered on one side by Isola dei Cavoli and on the other by Isola di Serpentara, nowadays a Marine Protected Area. There are eight different types of room sub-divided into: Monte Garden and Monte Superior (hilly area), Casbah Standard e Casbah Superior (in the central area), Domus Standard (second floor) and Domus Junior Suite (ground floor and first floor), Dimora Family Apartment and Dimora Family Junior Suite (located in buildings with 2 floors in the central area), Suite. 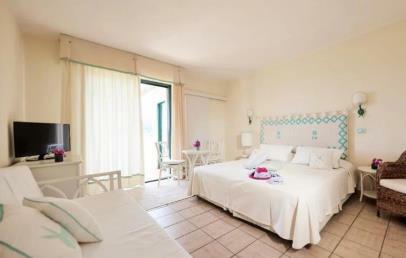 The rooms differ in size, distance from the beach, location within the resort and services included. 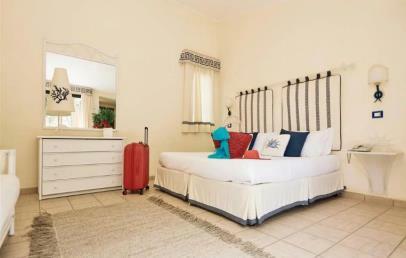 All have air conditioning (in our Family Suites and Family Apartments the air conditioning unit is positioned at the entrance), bathroom with shower and hairdryer, satellite TV, fridge and digital safety box. The beach has fine white sand and slopes gently down towards the sea – perfect for beach games, walks along the water’s edge or for letting children play freely together. It is about 200 meters from the central services of the resort. Beach services are not included in the room rate: prices vary depending on where your sun lounger is positioned on the beach. Loungers can only be reserved at the gazebo at the main entrance to the beach, and can be reserved either for the duration of your stay or on a day-by-day basis. Beach towels are available with a deposit (about € 20,00 plus € 2,00 for each change). Tanka Spa offers a wide range of services designed to pamper the body and stimulate physical well-being. Try it out and say good-bye to stress and worries. Set in a magnificent garden, the spa provides all you could ever wish for when it comes to relaxing, being pampered and sweating it out in the gym. Our spa boasts three large hydro massage pools and thalassotherapy pools, with thalassotherapy treatments offered using an innovative combination of natural substances. In this area, guests will also find the sauna, the Turkish bath, multi-sensory showers and a large relaxation area. Personalised treatments, including beauty treatments, holistic relaxing massages and shiatsu and Ayurveda massages are also available. In addition, a large gym is available to guests with personal trainers on hand to help. Paid service. The resort makes available for the use of guests – free of charge – 1 pitch for five-a-side football, 2 bowling alleys, one mixed court (basket/volleyball), 6 tennis courts and an 8-hole mini-golf course. There are also other activities such as archery, ping pong, canoeing, beach volley and beach tennis. 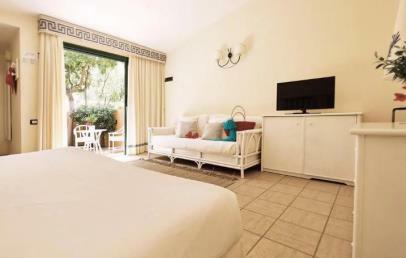 The following attract payment: horse-riding, scuba diving and sailing; push bike rental, 18-hole golf course at Tanka Golf Villasimius (with shuttle bus and special rates for hotel guests). The resort’s staff has always paid great attention to younger guests, with ample space dedicated to kids and teens offering a great chance to enjoy a holiday in absolute freedom, peace of mind and safety. Voilà Baby (0-2 years) – a fully equipped Nursery (sterilisers, bottle-heaters, induction cooktop, saucepans, dishes, mixers, fridge and microwave) available from 07.00 to 23.00. During assistance times (12.00-14.00 and 19.00-21.30) there is availability of specific products (blended vegetal broth, vegetable soup, fresh fruit, homogenized products, fresh milk, yogurt, water, fruit juice, diapers). Assistance in various languages is available from 09.00 to 21.00; kids may lunch and dine with the activity staff (a free service for guests choosing full board; costing € 15.00 per meal for guests choosing half board) and may take part in craft activities, soccer, tennis (7 years and over) and dance classes (from 3 years). Baby dance and weekly shows. Available from 10 to one in the morning, the Young Club Experience will take care of the older kids allowing them to take part in great sports activities and entertainment, organizing special sports and entertainment activities, not forgetting discos. The resort also offers a play room with videogames and Wi-Fi connection. At VOI Tanka Resort a wide and varied selection of food and drink options with buffet or à la carte menu is offered. The buffet at the main restaurant Oasys, close to the beach (max. capacity 1800 people) will manage to satisfy several gastronomic requirement with a varied menu ranging from typical Mediterranean and Italian dishes through to typical Sardinian specialities. During meals water, soft drinks, house wine and draught beer are included. The Pizzeria is located opposite the Tanka SPA and a close to the Restaurant Oasys, by reservation and with table service. Guests can choose the Pizzeria as an alternative to the Restaurant Oasys or the Restaurant Mirto, as provided by your treatment). 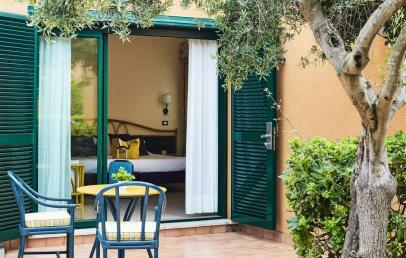 The restaurant Mirto, at a scenic spot close to the pool and central square is reserved for dinner (with a buffet service) for guests staying in Domus Standard, Dimora Family Junior Suite, Domus Junior Suite and Suite. At lunch time it is open for all guests, upon reservation and for a fee. It is open from 01/06 to 14/09 - dates are flexible. The restaurant Roof Mirto is open for lunch for guests of the Resort with à la carte service. The Stella di Mare Restaurant will delight the hotel guests with its tasty barbecue dishes and the excellent seafood cuisine. The restaurant is located next to the beach and offers à la carte service, upon reservation and for a fee. The restaurant Cucciolo is a reserved area at the Oasys, exclusively for children with designed to meet their needs. Lunch for guests staying in full board is included, with supplement of € 15 per meal, per child for guests staying in half board. The bars La Piazzetta, Music Bar, Bar Nettuno and until late at night the Giardino dei Sapori (paid service) offer a wide range of drinks, cocktails and juices. Half board in buffet restaurants includes water, soft drinks, house wine and draught beer are included. The opening of the restaurants is at the hotel's discretion. The opening of the Pizzeria, the Roof Mirto, the restaurant Stella di Mare and the Giardino dei Sapoti is not guaranteed throughout the season nor every day of the week. VOI Tanka Resort’s tradition holds that fun is an integral and key part of any holiday. The numerous and varied sporting and entertainment activities have been designed with guests’ satisfaction in mind: during your holiday you will be able to do all those things that you just can’t find time for in your day-to-day life. Our entertainment staff are all competent professionals, able to respond to each and every request you may have regarding sporting, creative and entertainment activities; 1 mini train to get around the resort (predefined stops and timetables); outdoor, unguarded car park; group sport classes and use of fields and playgrounds; swimming pool and gym. Dog Village – € 70 per room/week, € 10 for each further day. No provision of food; it is not possible to accommodate more than one dog per room. - dog bed in room, bowl for food and water. This extra package is subject to change according to availability. The city tax is € 4.00 per person per overnight, to be paid on-site. Internet access is available (free of charge) only at the reception, the swimming pool, the central bar and the beach. Apartments located in buildings with 2 floors with elevator, in the central area near the Miniclub, about 200/300 meters from the sea. 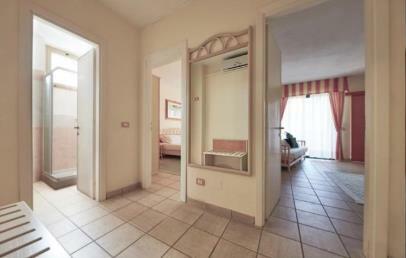 They are composed of a double room and a living room with 2/3 beds. 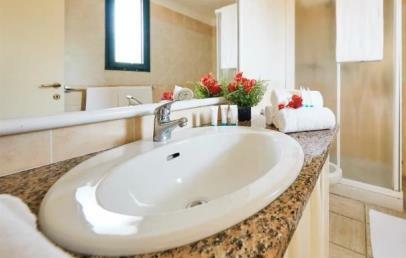 The two bathrooms dispose of shower; the rooms can accommodate up to 5 persons. 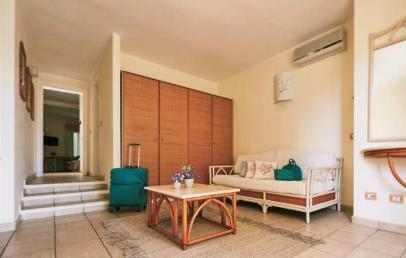 The air conditioning is located in the entrance of the apartment. They have a large terrace and a private reception. 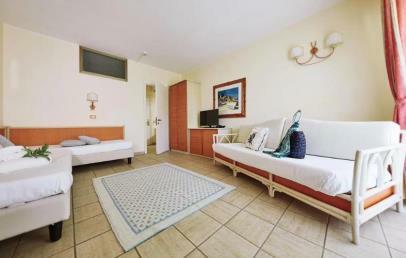 Spacious apartments situated in a private area, about 400 meters from the sea, spread over three buildings on two floors with a lift. The rooms are located on the ground floor (quadruple rooms) or on the first floor (triple rooms) and consist of a bedroom and a living room. 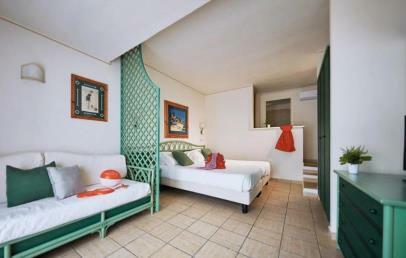 The two bathrooms have a shower or a bathtub; the rooms have a private terrace or a patio. In the room there are a few steps. 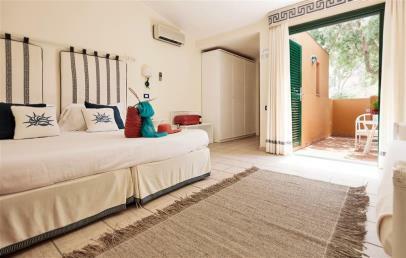 Guests of the Domus Junior Suite have a indipendent reception. 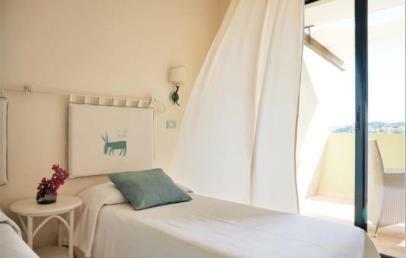 Bungalow studios located in the central area, about 200/400 meters from the sea, available on the ground floor or on the first floor. They’re composed of two beds and a sofa bed. Some rooms dispose of a nice balcony/patio; all have the shower in the bathroom. Guests have a dedicated reception and a reserved table in the outdoor area at the Oasys restaurant. 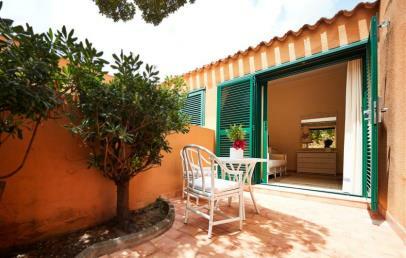 Bungalow studios located in the central area, about 200/400 meters from the sea, available on the ground floor or on the first floor (with patio, balcony or window only). They’re composed of two beds and a living corner with sofa bed. There are a few steps in the room; on request, rooms for disabled people are available. All rooms have bathroom with shower. 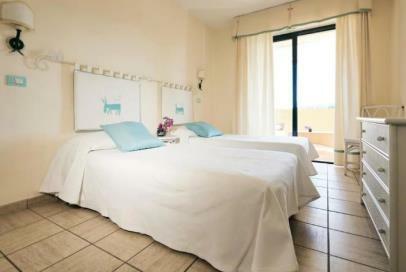 Apartments located in buildings with 2 floors with elevator, in the central area, about 400 meters from the sea. 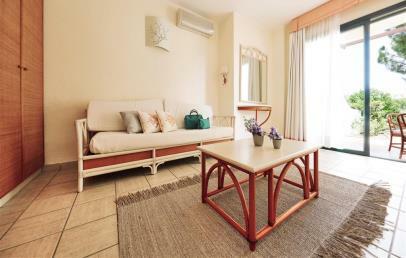 They are composed of a double room and a living room with 2/3 sofa beds; the air conditioning is located in the entrance of the apartment. The two bathrooms dispose of shower. They have a large terrace and are a good solution for families. 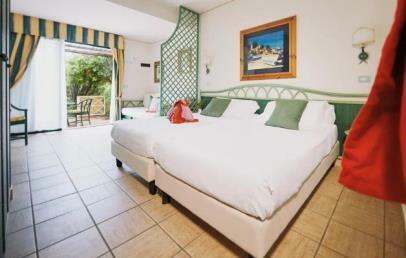 The Monte Garden studios are located on the hilly, panoramic area of the Resort. They have 2 single beds and a sofa bed. They distance approx. 600 to 800 meters from the sea.